This one was an engaging knit, guys. We Were Seeds follows seeds, that is seed stitch, through germination- there's lots of sprouting and climbing involved. I've never knit a pattern that told a story. 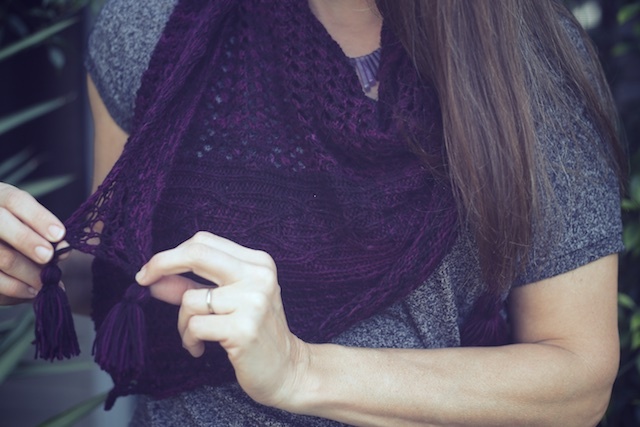 Each stitch pattern is long enough to easily get the hang of, but changes before you can get tired of it. That's so to an essential these days. I couldn't put it down, except when I had to. 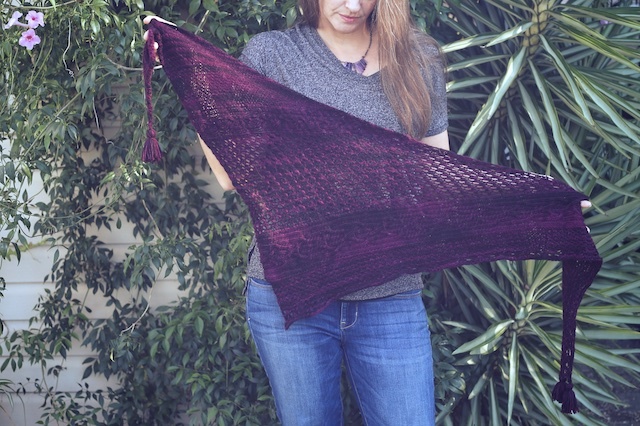 Some of the things I love about this shawl: It only takes one skein- perfect for all of those single skeins floating around! It was also interesting the whole way through, as I mentioned above. I also love the versatility. 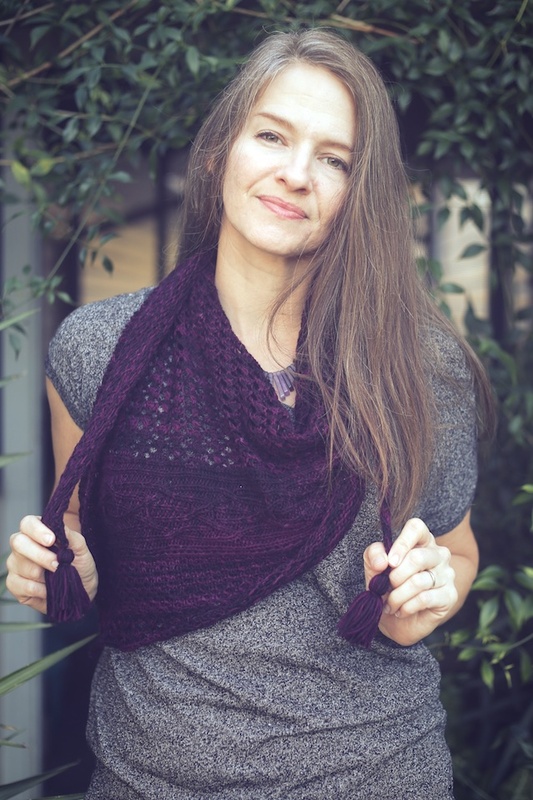 It can be knit in multiple colors or in a solid and look great. You can see examples on the pattern page. I also really like how one end is squared and perfect for two tassels. Just really cool. This was knit for a friend who has been sick a lot this year with different nagging complaints that, though not all serious, have left her worn down. She is also one of a very few people who notices handmade knitwear. One Sunday, at church, she complimented my Waiting for Rain and I knew I wanted to make her something. 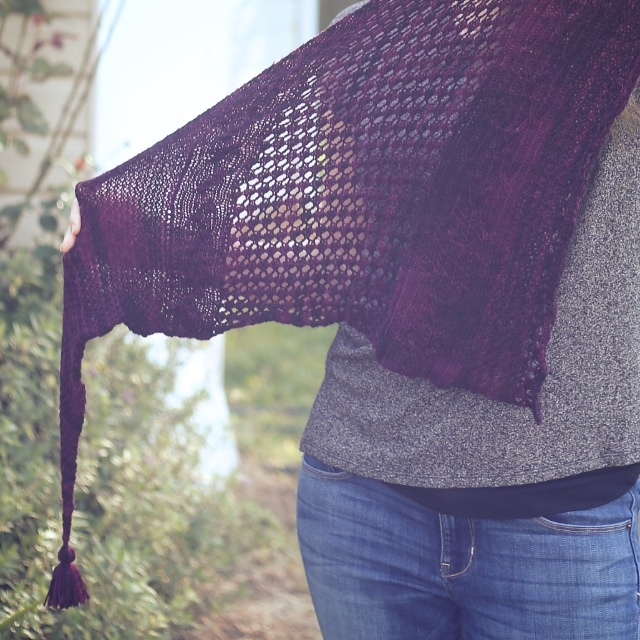 I thought it was safest to stick with a similarly colored scarf/ shawl, since it elicited feedback. You see, there's no real knitting culture here. I know many people who own nothing knitted, except tee shirt material. Most people wouldn't even consider a sweater being handmade. This is kind of off the subject but I did make a friend at BSF who not only knits but works at a our only local yarn store. I thought the store had closed, so it was wonderful to meet her and know the shop is still going strong. Could it be that I may actually find myself typing the much coveted term LYS? 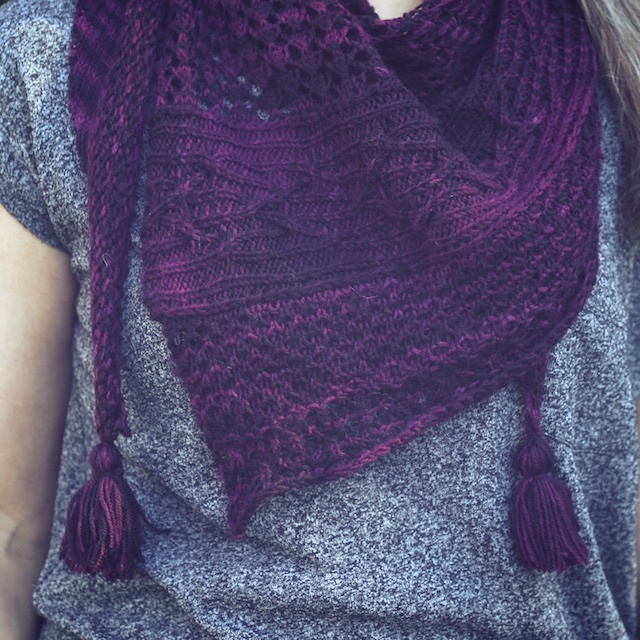 Details: So, I used some Stroll Tonal yarn in Cordial and size US 4s to knit this up. I used every single inch of this yarn, too. Things went smoothly and I enjoyed this project thoroughly! 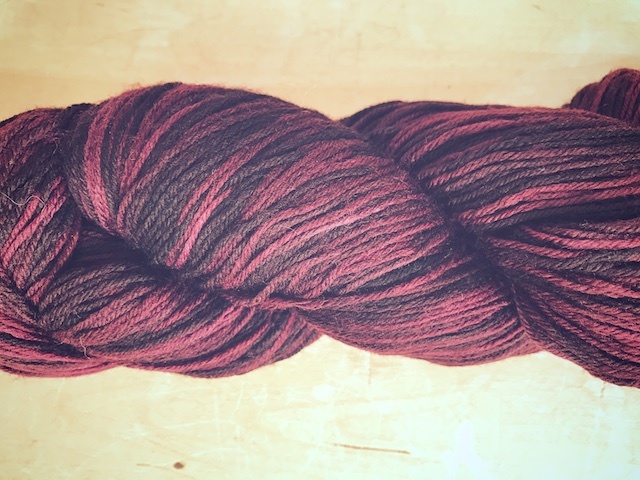 After binding off, I soaked the shawl in a bit of Soak with a teaspoon of vinegar because oh my gosh this yarn bleeds! I was prepared for it because I know lots of reds do that. It will still bleed, but I gave the new owner washing instructions and warned her so she won't throw another hand washable knit into the sink with it. It is highly unlikely that I know anyone in my personal life that hand washes knits, anyway. With my remaining yarn ball, I wound a strand around the width of a dvd case about 25 times then cut this loop at each side of the case. This became one of three tassels. Here's a quick visual tutorial to show how to make one, if you don't already know. Youtube video gets to the point. I need economy of words, People!! I am also a hypocrite. Insert smiley face. 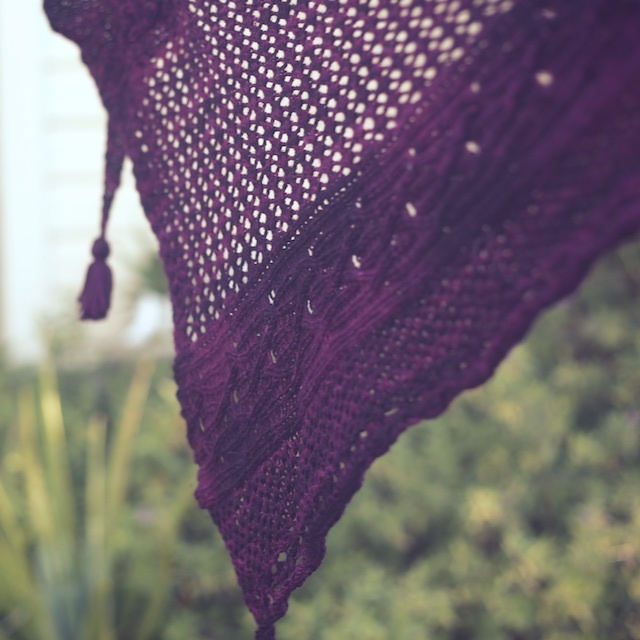 I have yarn for another Cassondra Rizzardi pattern- Equinox. I love the idea of it and how hers is very obviously a forest silhouette. This makes me think of driving through the Black Hills or of entering Yellowstone, before the traffic makes you feel like downtown Houston. 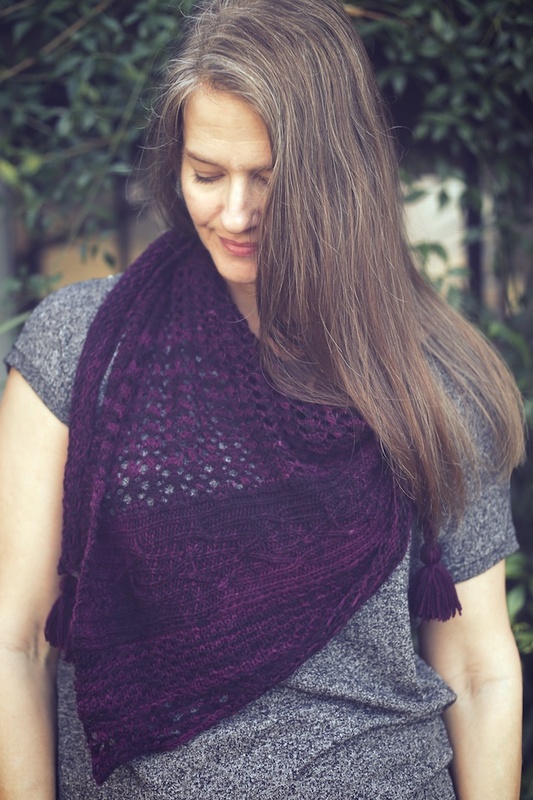 What are your favorite one skein projects? And before you consider clicking away without commenting because I never seem to answer, let me say that I have had some unusual circumstances lately, but am making my way through comments, emails, letter writing, house cleaning, etc. 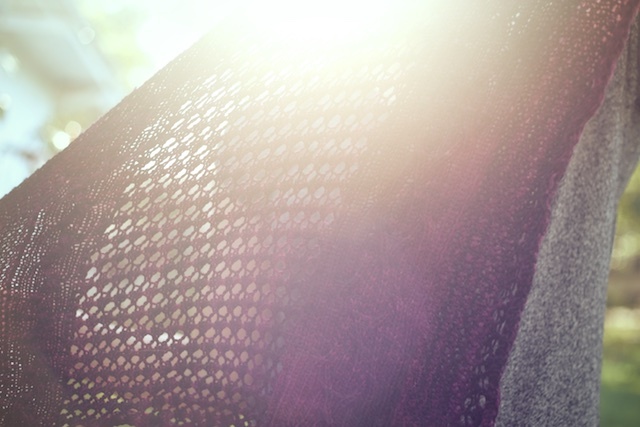 My one personal goal right now is to have time to communicate with my friends via the blog and ravelry and to do it much more. I will respond because I love you guys! !